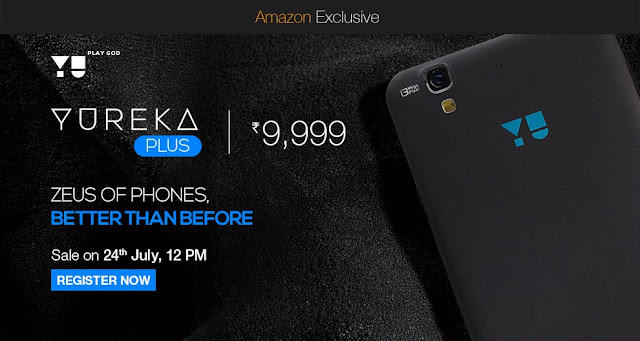 Yureka Plus Smartphone: YU, the online-only sub-brand of Indian handset maker Micromax, has launched Yureka Plus, the upgraded version of its first budget smartphone, Yureka, at Rs 9,999. The phone will be sold through a flash sale on Amazon starting July 24 at 12 noon. Registration for the sale starts today. The Yureka Plus comes in an 'alabaster white' colour variant along with the moon dust colour variant. The major highlight of the the phone is its upgraded 5.5-inch full-HD (1920x1080p) display. Powered by a 64 bit 1.5GHz Qualcomm Snapdragon 615 octa core chip and 2GB DDR3 RAM, the phone has 16GB internal storage expandable up to 128GB via microSD card. It runs Cyanogen OS 12, a custom aftermarket version of Android 5.0 Lollipop, developed by Cyanogen. Cyanogen is known for its customisability, enhanced performance and additional features. The look and feel is very close to stock Android barring a few UI elements, although customization is possible via themes. YU Yureka features a 13MP rear camera (f2.2 aperture capable of 1080p video capture) and a 5MP front camera with 71 degree field of view. In terms of connectivity, the dual-sim phone supports 3G, 4G (CAT 4, including TDD-LTE, Indian 4G bands), Bluetooth 4.0 and GPS. It comes with a 2500mAh battery which the company claims delivers 210 hours of standby time.